Our population is getting older, as many adults know all too well. Every day, 10,000 people in the U.S. turn 65. The AARP projects that by 2050, 55 million adults in the U.S. will be 65 or older. Among this group, the number of people 85 or older — “who,” the AARP notes, “often require additional caregiving and support” — is expected to increase and make up about 21% of the population by 2050. That’s up from about 14% of the population today. To millions of families across the country, all of this isn’t exactly new. Today, more adults than ever are finding themselves caring for an aging loved one. Often, people take care of their elderly parents while also providing care for their younger kids at the same time. In short? Many people today will end up becoming family caregivers, providing care for their parents as they grow older and require additional support. For those just navigating this process for the first time, it can be remarkably tricky learning to care for the person who took care of you. Switching from being a care recipient to a caregiver can be a daunting role reversal, for you and for your parent alike. For many adults, it can feel odd to slide into the role of the family decision-maker – especially if that’s a position that your parent traditionally occupied in your life. In other cases, it can be difficult to cope with caring for a parent who seems changed, different from the person you remember. And at the same time, many adult caregivers are also dealing with work and other family commitments, making things feel even tougher. While being a caregiver is a remarkable act of love and devotion, it’s hard to deny that it can all be a lot to handle – and it can be difficult knowing where to start. In some ways, it might help to think back to the way your parents took care of you. Many of the lessons you remember from your childhood could serve you well as you think about caring for your elderly loved one now. Did you ever accidentally scrape up the family car – maybe shortly after getting your driver’s license? Or left a window open during a rainstorm? Forget to feed the cat? The point is this: Think about an embarrassing moment from your childhood, or a time when you broke the rules. How did your parent react? In many cases, we’re willing to bet that you were surprised by the amount of love, compassion, and empathy that your parent demonstrated, even in a difficult time. This is an example to emulate now! It’s important to recognize that this is a time of transition for your loved one, as well as you. Rather than trying to take control of everything, be patient and flexible, and take care to truly listen to your parents and their needs. Be open and receptive, and recognize that becoming a caregiver will be a learning process for everyone involved. It might take time for everyone to get used to a new situation, or to figure out the communication style that will work best for your family. Don’t get discouraged or angry if the pieces don’t fit overnight, and be ready to approach each new challenge with an open mind and a willingness to collaborate. Just as your parents may have once encouraged you to go out and make new friends at school, it’s time to remind them of the importance of being social as they grow older – and to take steps to help, if they need it. Isolation, boredom, depression, and loneliness are some of the biggest, most debilitating problems facing seniors. The hard truth is that it becomes harder to stay social as we age, and friends and family pass or move away, mobility becomes more of an issue, and many people tend to lose energy and enthusiasm. 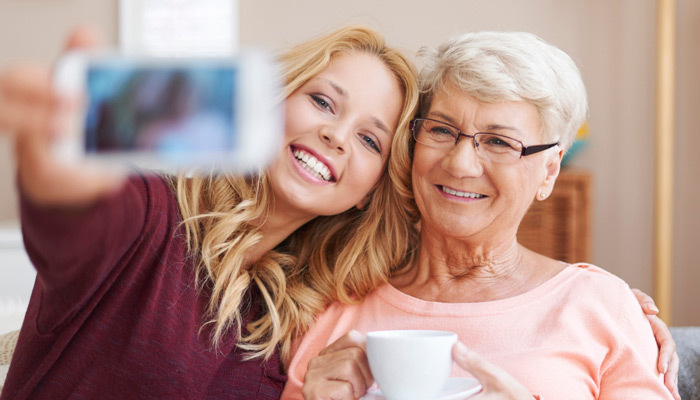 Helping your parent stay social could well be one of the most important things you can do to keep them healthy and happy over time. There are many things you can do, big and small, to help. In some cases, you may want to spend more time with your parent yourself, visiting more often, scheduling regular phone calls, or bringing back family dinners. You could also encourage your parents to join social groups, or volunteer in community organizations. And finally, professional companionship and caregiving services could help, as well, providing company and transportation services to your parents when you can’t. Growing up, was there ever a time when your parent seemed to swoop in and help you out at exactly the right moment, without you even having to ask? Maybe it was stepping in to help you finish up your science project at the eleventh hour; maybe it was fixing you up with hot cocoa and a blanket after a particularly tough day at school. A lot of it can be chalked up to parental intuition. Sometimes, of course, a mom or dad just knows. But other times, that parental “ESP” was actually the result of a watchful eye, from a person who knew what warning signs to look out for. As you become a caregiver for your aging parent, it’s important for you to learn which yellow flags and warning signs to watch out for, which might signal that your parents need additional care. Health issues, poor housekeeping, weight loss, falls, missed appointments, and other troubles keeping up with activities of daily living can all be signs that it’s time to seek help. Many older adults face issues with nutrition, medication, and driving. It’s important to keep an eye out for trouble, and recognize that someone has to be the decision-maker. Even if it leads to a difficult conversation, watching for changes in your parents and being proactive could help keep them healthy, and avoid more serious difficulties down the line. Did your parents ever take a vacation, sans kids? Did your mom plan a monthly spa day, or did your dad block out time to spend working on his car? This is because they recognized the importance of self-care – an important lesson to take away as you prepare to become a family caregiver. The reality is that, while caregiving is rooted in love and respect, it can also be incredibly difficult. Caregiver burnout is common, and many people who spend time caring for aging or sick loved ones report feeling higher rates of stress, depression, and anxiety. In some cases, caregivers have been known to self-harm, or report lower quality of life. As you spend more time caring for others, it’s vital that you don’t forget to take care of your own needs – eat well, stay hydrated, and get some rest and relaxation wherever possible. Take time for yourself. It may help you to find an activity you enjoy and carve out time for it. Similarly, recognize that you don’t have to go it alone, and consider spreading work around among loved ones, or seeking out the assistance of respite care services. Bottom line? It’s incredibly important to rest and recharge – both for your own sake, and for the sake of your loved one. Have you ever heard the expression that “it takes a village to raise a child”? Thinking back, doesn’t it ring true? Think about all of the people who played some important part in helping to raise you – doctors, babysitters, family members, teachers, neighbors, friends. Everyone has a part to play. The same goes for senior care! When it comes to giving your aging loved one the support, care, and attention they need, many people have a part to play. Why not ask for help when you need it? As you step into your role as a caregiver, recognize when you’re hitting your limits, and don’t be afraid to ask for help. It could make all the difference, giving you back time and allowing you the respite you need, while also giving your loved one the care and service they deserve. There are many options out there that can be of assistance – including non-medical home care. WIth a companionship or caregiving service, you can rest assured that you’ll always have a professional on hand to fill in when you can’t, providing your parent with attention and care when they need it most. That’s where Companions for Seniors can step in to help! If you have any questions about caring for the older adult in your life, don’t hesitate to get in touch with Companions for Seniors! We’d be happy to be field your questions or concerns, share our experiences, and talk over what it takes to care for your aging loved ones. If you have a parent or relative that you believe could benefit from the assistance of a professional caregiver, please don’t hesitate to reach out to one of the professionals at Companions for Seniors. Our companions are trained, bonded insured, and can help your family shoulder some of the burden of caring for an aging loved one. We are locally owned and operated in Chicago, with clients in the city and suburbs. We help provide seniors with a higher quality of life, while also offering respite and peace of mind for a family caregiver who might need some support. Our companions help stimulate our clients physically, mentally, emotionally, and spiritually, empowering them to live an active and enriched lifestyle.